However, this is something many commenters seem to miss. Many comments are one lined statements that immediately stop without progressing further. Even something as simple as 'Thank you for this post' is hardly what you would call encouraging a conversation. Yet this kind of action is such a missed opportunity. Many chances have been lost through a lack of imagination of what to write when it comes to conversation in commenting. Humans are sociable beings and many of us also thrive (even though we won't admit it) on conversation. Only hermits who live in caves seem to survive without it. But the majority of us are not like that. Loneliness is a big problem in today's society. We don't get much chance to have conversations, and technology has also contributed to this. Most interaction, albeit on social media, is bitty and disjointed. Someone pours out their heart and soul into an update, and most of the replies are just one-liners. And yet Facebook has changed its algorithms to encourage more conversation in commenting. More discussion is supposed to result in more reach. However, I think this is going to take some time for people to change their habits to take advantage of this. Conversation is not only good for social support, it is also good for the cognitive activity of our brains. Social interaction with other people has an effect on your memory, decision-making, learning and other functions. This isn't only confined to face-to-face conversation. Even though we may not be actually speaking, writing still uses the necessary brain activity required to converse. We are merely thinking what we want to say, and transferring those thoughts through the keyboard onto the screen. There is still the need to listen (read carefully), understand and compose an appropriate answer. Lack of facial reactions may create a void, however emotions can be expressed through emojis and memes. And conversation in commenting can be improved through well written prose. Conversation is a way of making a connection with strangers. How many conversations have sprung up at bus stops when the bus is late? Even the lady at the checkout who realised her top was the wrong size sparked off a conversation. What is needed is a relatable topic, feeling comfortable with the situation and finding a common denominator. I met one of my best friends at a buffet, when both of us where stuffing our faces with sandwiches. Both of us admitted to having not eaten all day, and this lead to finding out the reasons why and what we had in common. Conversation in commenting is a good way of finding out more about the content's author, or even the other readers. Nobody can gain much from only a few words of acknowledgement. Whereas asking a question or offering something more substantial could spark a much better reaction. Debates, leading to discussions, are a great way of expressing views and promoting ideas. However, standing on a platform to speak to an audience is either liberating or daunting (depending upon your personality). Comment boxes also provide the same opportunity. Except that you are not quite so visible and you don't have to project your voice to the end of the room. This is a perfect space to have your say. In spite of what people think, blogs are much friendlier places to comment. This is more appropriate than social media where you are massively exposed to anyone. Conversation in commenting has a much better change of appreciation and response. The orator can learn from the feedback received, and any discussion that arises can be constructive and rewarding. When you have a conversation with someone, there is the chance to introduce yourself. Not only in parties, but also to waiting in queues or sharing a lift (elevator or taxi journey). Sometimes there isn't much time, so the conversation needs to be concise and accurate. A bit like a promotional pitch at a networking meeting. Get it right, and it will spark interest in the other person, who will want to continue talking to you. This is the same for comments. Take the time to really think what you are writing. How can you attract the right kind of attention to yourself in a conversational way? Striking up a connection like this is much friendlier and forthcoming than an unimaginative couple of words. Having the ability to discuss new ideas and even revisit old ones enables a deeper understanding of the subject in question. Conversation in commenting allows people to express their point of view on any particular topic that hasn't been covered in the original post. Commenting allows the reader the opportunity to share and learn from others. Conversations can result in requesting information or giving advice where necessary. Such interaction would not be possible from a limited response of only a few words. Conversation allows readers to show an interest in other people. This makes what they have to say more receptive. And also contributes towards the know, like and trust factor for making advantageous connections. Like all good conversations, getting a response is imperative for it to continue. Anybody talking to themselves will soon realise and stop. There is nothing more despondent than a lack of recognition or appreciation. So conversation in commenting will have a much better effect if there is some return dialogue. This can be either from the post's author, or from other readers and commenters. And this should be also more substantial and worthy to encourage more of a discussion. Here is a chance to explore different angles or view points, make corrections or add value, vent off steam or unburden your problems. The post's content should be written to influence a reply, to make it more interesting for others to read. 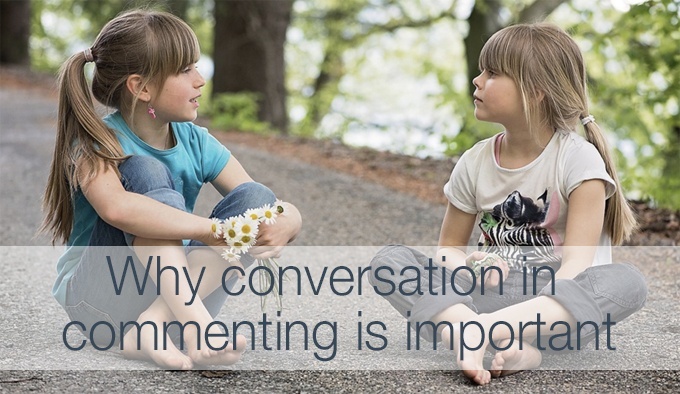 Have you benefited from conversation in commenting? Tell me any stories or anecdotes you may have about stimulating conversations from replying to a post. It can be either from a blog or on social media. We all love stories and this is a great way of creating a conversation in commenting. The comment box is just below, and we would love to hear from you!